The buffalo on the reverse side of the Buffalo Nickel is a male North American bison. James Earle Fraser, the designer of the Buffalo Nickel, always said that the model for his buffalo was Black Diamond, a huge bison from the Bronx Zoo. However, this story is questionable because Black Diamond never lived at the Bronx Zoo (he was from the Central Park Zoo) and because the buffalo depicted on the coin does not look much like Black Diamond. The words “UNITED STATES OF AMERICA” stretch above the buffalo along the edge of the coin. The motto “E PLURIBUS UNUM” (“From many, one”) appears just above the buffalo’s back and hip, under the “UNITED STATES OF AMERICA.” The placement of the motto appears to be a little cramped. 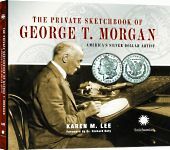 Charles Barber, the Chief Engraver of the U.S. Mint, objected to the Buffalo Nickel design in part because he felt it didn’t include enough empty space to place the words properly. 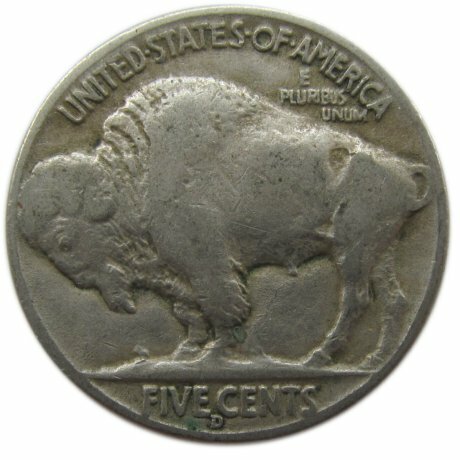 The words “FIVE CENTS” appear under the buffalo. The letters are raised and (like the date on the obverse side) are subject to wear. In later runs of the Buffalo Nickel, the words “FIVE CENTS” are larger and the buffalo is standing on flat ground instead of on a hill. This was an effort by Barber to make the Buffalo Nickel easier to strike and more durable, but unfortunately the changes he made were not very successful. The mint mark (if there is one) appears centered below the “FIVE CENTS.” A “D” mint mark stands for Denver and an “S” mint mark stands for San Francisco. A “P” mint mark or no mint mark at all stand for Philadelphia. Filed under Buffalo Nickel, Coins Reverse, Indian Head Nickel.